Welcome back to the sprawling Southern California suburb of Santa Clarita, where the weather is good and the undead are...Still adjusting to life among the living. Watch Sheila, Joel and Abby Hammond continue to navigate the murky waters of zombie-ism in this all-new trailer for Santa Clarita Diet Season 2, launching Friday, March 23rd globally on Netflix. In Santa Clarita Diet, Joel (Timothy Olyphant) and Sheila (Drew Barrymore) are husband and wife realtors leading vaguely discontented lives in the L.A. suburb of Santa Clarita with their teenaged daughter Abby (Liv Hewson), until Sheila goes through a dramatic change sending their lives down a road of death and destruction...But in a good way. Picking up right where we left off, Season 2 of Santa Clarita Diet finds the Hammonds trying to adapt to Sheila's now-advanced undead state, even though she's desperately working to hold on to her suburban lifestyle and not be defined as just another monster. Unfortunately, while the family has become markedly better at murder, the number of missing people in Santa Clarita is starting to pile up and it's no longer going unnoticed. Meanwhile, the Hammonds are chasing the source of the virus so they can stop it from spreading and save humanity, which seems important. Through it all, Sheila and Joel are grounded by their unconditional love for one another. Sure, being undead, or loving someone who is, isn't always easy, but don't all relationships have their challenges? A first look at these all new episodes arrived in mid-February. It was then that Netflix announced some exciting new cast additions to the shows. Joel McHale, who recently got his own weekly Netflix series, will be stopping by to make an appearance alongside Maggie Lawson, who guest star as Chris and Christa, married realtors in Santa Clarita described as a "more successful, more aggressive version" of Sheila and Joel. The great Gerald McRaney, who is really a TV treasure at this point, also turns in another iconic guest star appearance as Ed Thune, a retired army colonel (of course!) who Joel finds very intimidating. Will any of them become victim to the virus? Or worse yet, will Sheila eat one of them? Anything's possible in the 'Burbs. 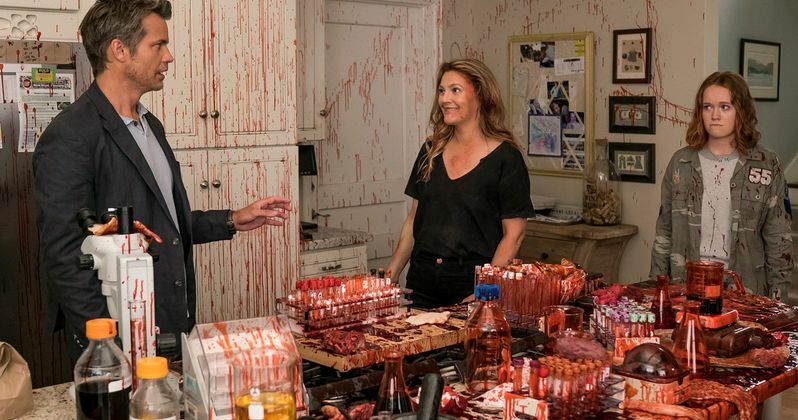 The single-camera Santa Clarita Diet first made its debut in February of last year on Netflix and has gained a significant following on the streaming service. About a month after its premiere, Netflix announced that the show had been renewed for this second season. While the show gained praise, it was also criticized for a lot of the graphic scenes depicted within the episodes, which included a lot of flesh eating and blood. But hey, the show is about a flesh-starved women who likes snacking on fingers and eyeballs. What did you expect? Hopefully, for all our sake, the second season of Santa Clarita Diet won't tone down its gleefully gory romp through the traditional tropes of the American sitcom. That's one of the things that make it so great. You can check out the latest trailer thanks to Netflix.